Fantastically exclusive North Carolina mountain cabin, located near Boone in Ashe County on top of a 4000’ mountain and nestled among 6.5 wooded acres with a small mountain brook. 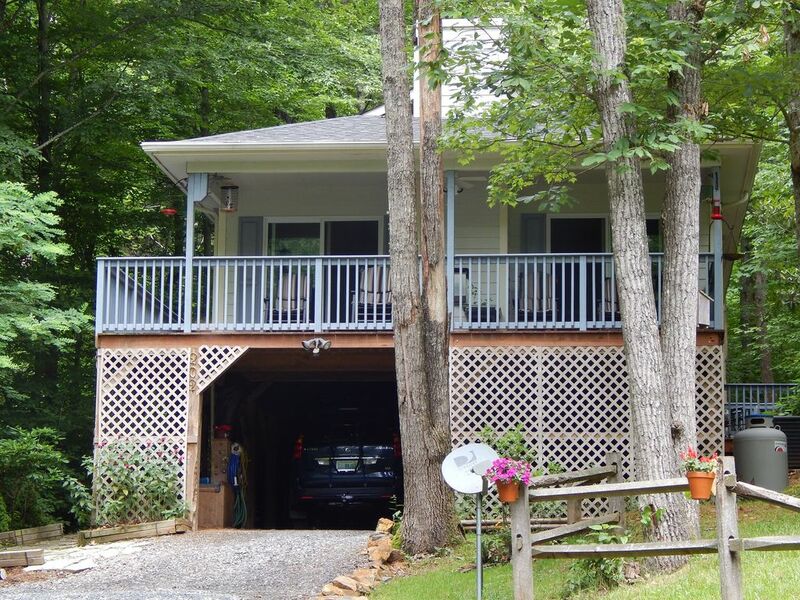 Just a 5 minute drive to the Blue Ridge Parkway, this elegant two bedroom, two bath holiday home has all the features that will make your mountain vacation unforgettable and relaxed. Located in Spruce Knoll Estates a private community near the resort towns of Boone, Blowing Rock and West Jefferson. The land surrounding the house is certified by the National Wildlife Federation as an official Wildlife Habitat. Every room has a forest view giving you the feeling of being in a tree house. Unwind in one of the many rocking chairs on the 250 square foot elevated and covered wooden veranda, or sit by a roaring fire on the lower stone patio. Enjoy the cool mountain breezes while listening to the calming sounds of the creek. Prepare your favorite meal on the grill. Within a short distance from the cabin are numerous year round activities for all ages and lifestyles. Activities include: cycling (mountain and road), whitewater rafting, rock climbing, kayaking, antiquing, trout fishing, canoeing, tubing, hiking, golfing, zip-lining, shopping, music festivals, art festivals, gem mining, sight seeing, swimming holes and farmer's markets. In the winter months there are many 'choose and cut' Christmas Tree Farms, downhill skiing, cross country skiing, snowboarding, ice fishing, snow tubing, Local attractions include: Appalachian State University, The Blue Ridge Parkway, Church of the Frescoes, National and State Parks, Tweetsie Railroad, Mystery Hill, The Blowing Rock, Horn in the West, Grandfather Mountain, and The Scottish Highland Games. The master bedroom features a queen sized bed with deluxe comfortable pillow top mattress, linens, Fiber Optic TV, VCR/DVD, chest of drawers and closet. The master bathroom has a large vanity, fireplace, separate toilet room, shower, private outside deck and independent dedicated water heater. The second bedroom has one full bed and one twin bed above, linens, Fiber Optic TV and VCR/DVD and private outdoor deck. The second bathroom features a deluxe whirlpool tub and lots of cabinet space, hairdryer and towels. You will find an Fiber Optic smart TV with VCR/DVD in the living room, along with a natural gas burning fireplace and very comfortable reclining leather furniture. The kitchen features a dishwasher, garbage disposal, refrigerator with ice maker, stove, microwave oven, coffee maker, toaster, pots, pans, dishes, and silverware. The dining room has a country style gathering table with seating for 6. The inside utility room has a full sized washer and dryer, along with pantry storage, central heat and air conditioning. Park your cars and store your “toys” in the over sized covered parking area. We are high school science teachers and fell in love with the NC Mountains because of the numerous year round activities, cool summer weather and availability of winter sports. Our home is secluded yet we can get to Boone, Blowing Rock and West Jefferson in no time. We love the nature that being secluded provides and have purchased the property surrounding the house. We chose this location for it's high elevation yet it's ease of accessibility in the winter. This home is our relief from the hustle and bustle of city life and is very comfortably furnished for the ultimate relaxation. We especially enjoy the hospitality of the local people and we eventually want to spend our retirement years in the area. The history of the area is fascinating with Civil War Battles, NASCAR and Appalachian culture. Every time we visit we always find a new adventure, festival or site we haven't yet seen. We love the tranquil, peaceful, relaxing setting and great weather. The year round activities include: hiking, sight seeting, nature viewing, cycling, kayaking, art/music festivals, antiquing, snowboarding, skiing, changing fall leaves, boating, fishing, golfing, college sports, Blue Ridge Parkway, Scottish Highland Games, State and National Parks, rafting, canoeing, cross country skiing, tubing, shopping, and fine dining. Center Heat and Air, and supplementary heating throughout the house. Decks off each bedroom, and a covered deck off the living room. Many opportunities for kayaking and canoeing nearby. 3 Total Decks. One covered deck, two additional uncovered decks, lower stone patio with outdoor wood burning fireplace. 3 majors ski slopes nearby. Free public courts available in nearby Boone and West Jefferson. Many golf coursed in the area. Games, Book Library, 6.5 acres certified wildlife area, Bunk Bed has full bottom and twin upper, electric fireplace in master bath, private decks off master bath and second bedroom, stone patio with outdoor fire place, easily accessible in winter months, minimum age limit for renters is 28. Great for a ladies' getaway! Three of my best girlfriends and I rented this house for a weekend getaway (no husbands and no kids!) It was perfect. We spent all afternoon Friday when we got there and all day Saturday out by the fire pit because the weather was so nice. It was just what we needed. The house is well-stocked and very comfortable. It feels very secluded and private, even though there are other houses around. We would definitely stay here again. We had such a wonderful time at this sweet treehouse! We came to the mountains to celebrate my sons 18th birthday. It was absolutely perfect! Right away we felt at home. The house was so cozy and had such a warm feeling. We loved the wood and bear decorations all throughout the house. One of my favorite things was the heavy quilts on the beds. It was so comforting and warm. I had read many of the reviews about seeing wildlife from the porch and I was very excited about having coffee on the front porch and watching the deer. Saturday morning we slept in(as I said the beds were very comfy) and I missed them. But Sunday morning was a whole different story. I lost count at 10!! I saw little ones hopping around playing together. It was so sweet! A very magical experience. It was such a wonderful ending to our trip. As for the property in general. The layout is nice with both bedrooms having there own private porch. Very clean. Nice sleeping beds. Two bathrooms, one with a tub and one with a shower only. The drive up to the house was not bad at all. I had read reviews about GPS not taking people to the house but that was not the case with us. Also, the house was secluded but also central to many of the places we wanted to go to. Out list included: Boone, West Jefferson and Cascades Falls. Very easy drive to each one of those. Our kids 18, 21 and 17 loved this house. We had a wonderful experience with the owners. Carie made it very easy and carefree. We would definitely go to this property again! The house was neat, cozy and comfortable. It was cold while we were there and the house was not drafty or chilly - just right. The house was also really quiet, you could hear the heater blower go on but really no other sound. We slept great. We rented the house as a base camp for a hike up Grandfather Mountain and that was also awesome! Very nice clean property located in the woods but still close to all that the area has to offer. The house looked exactly like the pictures! The house was secluded which was nice ! The fire pit was great ! About a 25 minute drive to Boone . Enjoyed our stay ! Mimimum age for renters is 26, drivers license is required to verify age, and must be the same name on both the lincense and credit card. Check in is at 4:00pm. Check out is at 11:00am, early and late check in/out is possible upon request and contingent upon the rental schedule. Holiday Rates of $115 per night will apply on all Holiday bookings.